I love Dalt Vila. I’ve lived inside the fortress walls for many, many years now… I can’t imagine living anywhere else. It just feels like a real-life fairytale, each and every time I walk up the drawbridge into ‘my’ castle, and I never, ever cease to be amazed by the impressive stone walls, cobbled streets, maze of alleyways, eclectic bars, shops and restaurants, lookout points, views… and even the stray cat colonies too! So as you might imagine, I consider myself to be somewhat of an expert when it comes to the area. But I have to admit, sometimes it’s an area where I want to keep all my secret places and spaces to myself. After all, it’s my home. I love that no cars can drive into my barrio, that passers by rarely stroll into my street, that – despite its obvious popularity with sightseers in the high season – there are parts of Dalt Vila that still seem undiscovered, untouched, retaining their rustic charm even though the hipsters have started to move in at the foot of the hill! But! There is one recent discovery I think deserves a mention, as it is just such a special, unique dining experience I think everyone should experience at least once. 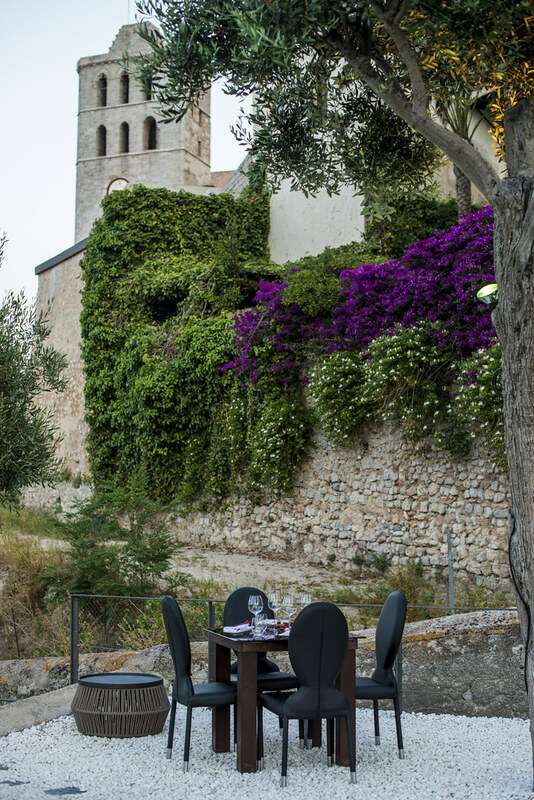 Kyupiddo by B.For is truly hidden, tucked away behind a discreet gate, in a back alley at the top of Dalt Vila, near the cathedral. And once you’re inside, it’s completely open-air, an amazing alfresco experience with no cars, no pedestrians and no noise to interrupt your revelry. Sure, I can almost hear you girls thinking… I don’t really want to traipse up and down the back streets of Dalt Vila looking for a secret gate in the hot peak of summer. Guys, I can hear you thinking, I don’t want her complaining about not being able to walk in heels on the cobbled streets. Stop right there! Kyupiddo (which, by the way is Japanese for Cupid!) has its very own little golf cart, with a lovely bow-tie clad driver, who will pick you up and drop you off at the base of the fortress walls. Even though it’s super close to my house and I COULD walk… I have to say, it was a treat to let them chauffeur me – if only I could have this every day when I walk to my car! After being dropped off at the doorway of the beautiful hotel La Torre del Canonigo, we were then led through a small tunnel, and around to the rear of the hotel, where we were greeted by a beautiful girl semi-hidden by a discreet door in the stone wall. Once we stepped inside, it was like landing in another world… totally peaceful, zen-like ambience with views across the whole port and up to the cathedral that truly make you feel like you are the king (or queen!) of the castle. 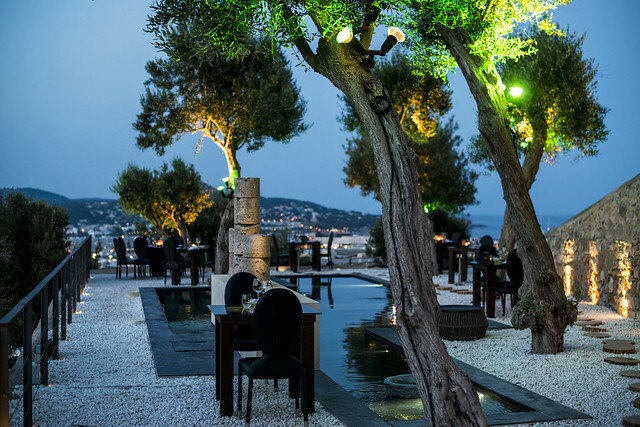 A sparkling swimming pool is the centrepiece of the restaurant, with the entire façade of the hotel reflected in the water as you look from one side, and the stunning sky and sunset from the other (presuming you arrive early enough for sunset – and I would recommend it!). A very intimate number of elegantly designed tables surround the pool, and a small lounge and bar area provide the perfect place for pre or après dinner cocktails, and the size means it’s never going to be overcrowded or noisy. On the subject of cocktails, Kyupiddo has its own twist on many of the classics. 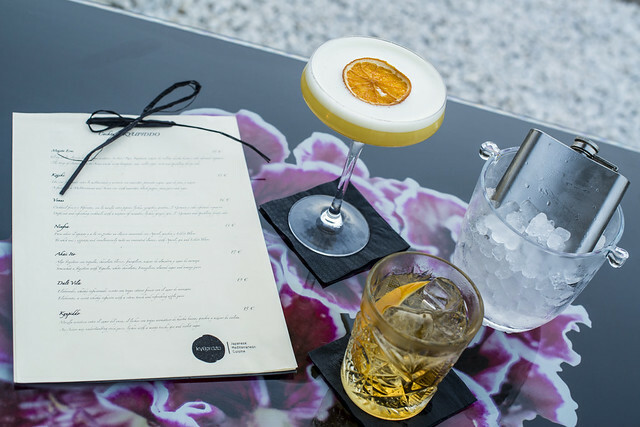 Expertly prepared by world-class bartenders, and exquisitely presented, the Japanese names are a little tricky to pronounce, but there’s nothing difficult about tasting them… yum! Although Kyupiddo is the latest creation in the B.For empire, don’t expect to find sushi on your plate here. The fine dining style menu is strictly fusion – Japanese and Mediterranean – with an emphasis on quality above all else. The first page of the menu is all about ultra-finely sliced carpaccio and tiradito, plus an array of fresh seafood starters and five-star caviar – Beluga of course darlings. I’m not going to give away the entire menu – some things need to be a surprise when you get there – but what I can tell you is there’s something to satisfy every appetite and every taste bud! Leaving room for dessert is essential, whether you have a sweet tooth or not! The most magical thing for me is watching night fall over Dalt Vila, the port and the Mediterranean Sea. Blue turns to rich, deep purple, gold turns to pink, white buildings become a wash of twinkling lights. The cathedral walls are softly illuminated and it’s one of the most romantic settings I have ever experienced in Ibiza. And then you get another joyride back down into town in the golf cart! Yahoooo!